as for auxiliary postman (753); for duties see porter. sorts and checks returned mail bags, and issues them as required. carries samples for commercial traveller (773) q.v. 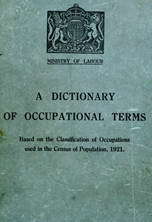 by hand or by truck; may be attached to outdoor staff of commercial hotel or may work on own account as out porter q.v. at railway station; accompanies commercial traveller on his rounds and assists him in unfastening and fastening packages of samples. in charge of bagmen q.v. attached to large commercial hotel, and is responsible for their timekeeping and discipline; allocates bagmen to commercial travellers (773) q.v. and keeps records of their hours of duty; furnishes daily records of hours worked by bagman, to cashier (939) q.v. ; is responsible for housing of barrows; sometimes also does work of bagman q.v. during winter months, carries coal (in buckets, sacks, etc.) from cellars to separate rooms of hotel, suite of offices, block of flats, etc. ; sometimes also removes ashes raked out from fireplaces by charwomen (922) q.v. ; is usually employed in other duties, e.g. window-cleaning, etc., during summer months; cf. coal porter (970). carries boards, joists, etc., from railway wagons to timber yard, and stacks them in piles so arranged that air circulates freely between boards, or carries timber from timber piles to saw mills or to machine shops. a fish porter q.v. who is a member of Fellowship of Porters of Billingsgate, London. a porter q.v. working in or around a fish dock or market; carries on shoulder or wheels in truck, barrels, baskets or boxes containing fish from one part of dock or market to another, or to carts, lorries, railway wagons, etc., to be loaded. a porter q.v. working in or around fruit market; duties as for fish porter. (ii) (depository ) a porter q.v. carrying furniture from van to store and vice versa; packs and stores furniture away with protective wrappings, etc. ; cf. furniture remover (945). does unskilled work of any kind in or around Post Office Stores; loads and unloads vans; carries material, tools, etc., as required. a porter q.v. specially skilled in stowing luggage and goods on air liner; assists passengers to enter cabin of air liner, and accommodates them in seats according to their respective weights, so as to balance weights on each side of cabin as far as possible; stows passengers' luggage and goods in luggage chamber, so that packages will not shift on journey, taking care also that packages are stowed evenly on either side, to balance liner. a porter q.v. usually licensed (see town porter), who plies for hire outside railway stations, piers, quays, etc., or collects luggage at hotels, houses, etc., by request. general term tor a porter employed in any market carrying goods to saleman's stand or from stand to customer's conveyance, includes fish porter, fruit porter, meat porter. a porter q.v. who unloads carcases of meat from railway wagons, lorries, etc., on arrival in market; carries carcases on shoulders and hangs them up on hooks in stalls or salerooms. fetches and carries stores or raw material in factories; packs and unpacks, loads and unloads, incoming and outgoing goods. packs and unpacks stores in Stores Department; fetches and carries stores by hand or on truck. a porter (Post Office) q.v. carrying parcels and mail hags containing parcels. (ii) conveys luggage, packages, hampers, etc., to and from railway stations, hotels, houses, etc., by hand, truck, barrow or vehicle; is sometimes required to take out a licence and wear a badge with a distinguishing number; sometimes specifically designated, e.g. barrow porter, delivery porter, shop porter, store porter, warehouse porter. ties up, seals and conveys mail bags from one part of building to another; loads and unloads mail bags into and from van, and lifts to and from van out of or into train; does heavy manual work in sorting office. a luggage porter q.v. attending at piers, quays, etc., to meet passengers at sea-port towns. a porter q.v., usually a luggage porter q.v., supplied with a badge by local authority or railway company and authorised to carry passengers' luggage from railway station or steamship wharf to private address, or to another station or wharf; cf. porter (706) who is employed within station. a luggage porter q.v. who conveys, by hand or truck, passenger luggage from one railway station to another in the vicinity.